With the rising number of computing devices being manufactured and used, coupled with the preference of digital storage over conventional methods like paper it is increasingly necessary to have an end of life disposal solutions for data storage devices such as Hard Disks, USB's, CD's and Phones. Your personal data such as passwords, credit cards information, confidential reports and documents etc. in the wrong hands could be extremely dangerous. Failure to erase data successfully could lead to identity theft, fines or lawsuits, irreparable damage to an organizations reputation, loss in consumer clients and in extreme cases can even lead to federal or civil liability. Data erasure is carried out by special methods that are approved by the United States of America Department of Defense which ensure that the data is wiped permanently and is irrecoverable by any present methods of recovery. 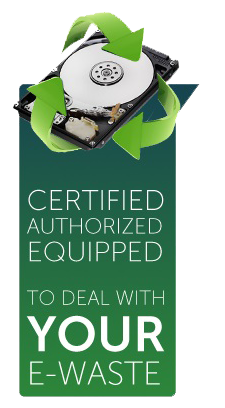 Advantages of data erasure are that the media(hard disk, USB etc.) can be resold or reused with complete peace of mind. A detailed report is generated for each hard disk erased to ensure that the process has been completed successfully. 1. Data wiping procedure approved by the United States DoD. 2. Erased media can be reused or resold. 3. Detailed reports for each hard disk erased. 4. On-site service for client's peace of mind. Data destruction is done by crushing the media (hard disk, USB etc.) and then shredding it to small pieces making the media unreadable and unusable.